Welcome to the GRC Geothermal Library! The 2018 GRC Transactions are now available for free download by members: click here for a list of the articles. To download the 2018 GRC Transactions or email citation lists, please sign in as a member in the upper right-hand corner of the screen. Non-members can join the GRC or order individual articles. All GRC PDFs from 2017 and earlier, plus several thousand additional non-GRC PDFs, are available for free download by everyone without signing in. The most recent issue of the GRC Bulletin can be found here. You will need to log in with your Member ID and password to access the PDF. The Geothermal Resources Council (GRC) is a professional educational association for the international geothermal community. Our database contains over 40,000 records on all aspects of geothermal energy, including exploration, reservoir engineering, power plant design and operation, direct use, geothermal heat pumps, regulatory issues, energy policy, energy markets, news briefs, and more. We provide article-level citations to: all GRC Transactions (1977 to present), all GRC Special Reports, numerous feature articles and news briefs from the GRC Bulletin (1973 to present), corporate and academic technical reports, journals, and books. 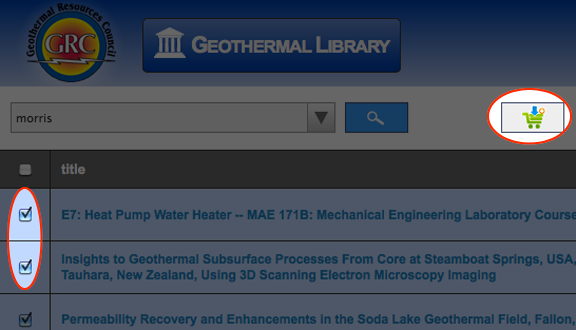 For suggestions on how to search this database, please see the GRC Geothermal Library Database Search Tips. You can also scroll down this page for a visual tutorial. Basic Search Type your terms in the search box and press enter. Advanced Search Click the arrow in the search bar for additional search options. 1. Create a citation list by selecting items from your results and then clicking the “Add to Cart” icon. 2. Your citation cart will appear in the upper right corner. Sorting Results Click the button labeled "Sort" in the upper right corner of the page to change the way your results are displayed. 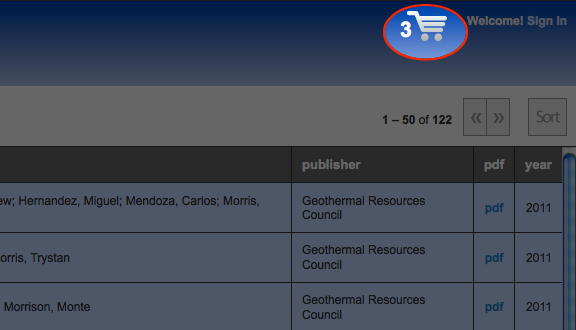 For more suggestions on using this database, see the GRC Geothermal Library Database Search Tips. The Geothermal Resources Council Library in Davis, California holds an impressive collection of resources on Geothermal and related subjects. Please help us expand our library by donating reports, journals, or books! A list of our current journal and newsletter holdings is available here. 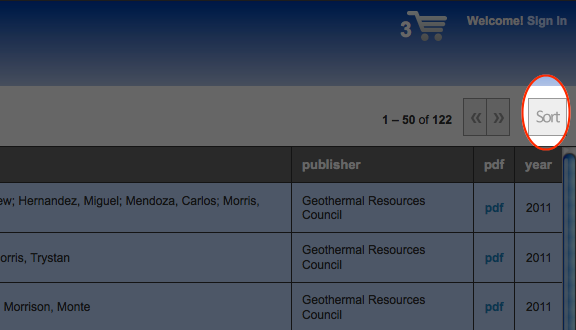 Notice to authors: The articles in this database have been provided to the public for the purpose of advancing geothermal research. If you are the author of an article that you wish to have excluded from the database, please contact the Geothermal Resources Council to have it removed. Acknowledgement: "This material is based upon work supported by the Department of Energy under Award Number DE-EE0002852." Disclaimer: "This report was prepared as an account of work sponsored by an agency of the United States Government. Neither the United States Government nor any agency thereof, nor any of their employees, makes any warranty, express or implied, or assumes any legal liability or responsibility for the accuracy, completeness, or usefulness of any information, apparatus, product, or process disclosed, or represents that its use would not infringe privately owned rights. Reference herein to any specific commercial product, process, or service by trade name, trademark, manufacturer, or otherwise does not necessarily constitute or imply its endorsement, recommendation, or favoring by the United States Government or any agency thereof. The views and opinions of authors expressed herein do not necessarily state or reflect those of the United States Government or any agency thereof."